My name is Katlyn Monday, and I and the owner of the Virginia Holocaust Museum, located in Richmond, Virginia. This museum has come upon a collection of photographs from the Holocaust and after investigating them we have found interesting data. We have stumbled upon a picture of you and your brother during the Holocaust. And we be delighted if you grant us permission to use yours and your brothers’ life story during the Holocaust. And we also like to use the picture taken you and your brother in this museum. I also hoping to gather information on this picture and your experience during the Holocaust. In your life story you talked about how you and your brother were both sent to a convent after the army discovered that your orphanage were hiding you and your brother. And I would also like to know more about your experience at the convent and how you felt being separated from your brother for so long. In the looks of the picture I discovered of you and your brother that you two were not that old when you went into hiding. How were you living situations in the convent and what did you eat and do there during your stay. Thank you for your time and for sharing your experience during the Holocaust. Hello my name is Drew Chafin and I work for the Virginia Holocaust Museum. We will soon be opening a new exhibit featuring many pictures and stories of real people to complement them. We hope to show the public a visual side of the Holocaust to more directly connect with them. I have been looking through the photographs we received from an anonymous donor. After authenticating them I was looking for stories online to match with the picture. I found your story online at http://www.holocaustsurvivors.org/. I read how you were in the camps for a long time and would know what these men went through. I want to gather more information of your story and your experiences regarding this photograph. In your story you show amazing perseverance through most things. You talk about the will to live even through the toughest of times. In the picture there are many emaciated men with very little clothing. Even though they are going through hell, their eyes shine with hope and a certain resilience that is profound. I have a few questions for your story though. You say on many occasions that you narrowly escaped death such as when you were almost hanged but saved by a transfer or when you were in the hospital and had to escape. This amazed me and made me think of some questions for me to better understand what these men in the picture went through. Were all of the surviving people there solely based upon luck or were they still alive because they fought more than others? How were the people there mentally? Also, how did you feel as you lost your comrades over time in the camps? Finally, what did liberation feel like? Thank you for taking the time to read this and for sharing your story with me. Thanks to you many people will be educated on the horrors of the Holocaust. I’m Brian and I saw a picture of a death train and it got me thinking about how interesting this topic is. I decided to research and look for some relief to what actually happened and while I was reading I noticed your story as one of the links when I was searching for stories about these awful trains. When I read about your story I was honestly moved and am now contacting you about using it in our exhibit! We’d love to, here at the museum, present and unveil this as a new display! The picture is of a death train and according to the website, you not only survived but also escaped to tell the story! In your story you talked about your life after you escaped a little and we’d actually love for you to come in and capitalize on that among other stuff to give the exhibit a little more backbone. You see we actually found some artifacts from the same estimated location and time as when you escaped. We think this exhibit will be really consuming to the viewers and would really love if you came out to talk and maybe even hold a discussion for people interested. We’d like to make you an offer to come out here and record some audio for the virtual tour and maybe do an interview or two for the paper. Thanks for reading this and hopefully you’ll consider. We’d really appreciate this and can accommodate you with a hotel room and some money for travel. Get back to me as soon as possible about your amazing escape on the death train. Hello, my name is Kyle Howard and I am a curator at the Virginia Holocaust Museum located in Richmond, Virginia. I found a box full of pictures from the Holocaust, and one caught my eye that included three children that either just came back from sledding or that are about to go. All three of them seemed to be joyful and full of life. The photo is captioned, “German Jewish children in Berlin Prior to the Nazi seizure of power”. I tried to find connections of the people in the photo, but I found nothing. I then came across your story that you told in 1947, and I would like to use your story in my exhibit and I would like to ask a few questions if you don’t mind. First, how did you feel about the other survivors that you had to live with during the time you spent in the sewer? How often to you think about the time you spent in there? How much can you tell me about you, and your brother’s life before the war had started? How do you think your life would have played out if the war never happened? Thank you so much for taking the time to read this. Click here to view the photograph. My name is Jazmin Rose, I am the curator at the Virginia Holocaust Museum, in Richmond, Virginia. The museum has received a collection of photographs from back to the holocaust, after looking through the photographs and researching the history of them, I have made many discoveries. I have read about you story of surviving the holocaust on many different online sources. I am hoping that I would be able to gather more information about a certain photograph that I have found and was hoping for your help for more information based on this photograph. In the story of your surviving, I have read that you and your younger brother, Zus, vowed to never be caught by the Germans. 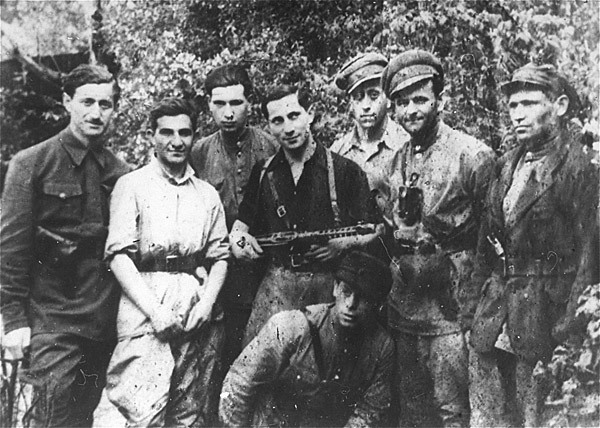 I’ve read in your story that you heard rumors about partisans, and decided that if you and all of the Jewish people were to survive, you must acquire arms and organize all Jewish resistance groups. Along with your two brothers, Zus and Asael. In the stories I’ve read that you and your brothers began to organize Jews. In the story I’ve read by May of 1942 you were in command of a small group which had grown to around 1200 people by the end of the war, known as the Bieleski otraid. Would the Virginia Museum and I be able to use your story for our exhibit as we try and explain the tragic events of the Holocaust? If so, I would like to ask you to answer a few questions if possible, so the museum and I can better understand your story. In your story, I read that you and your brothers teamed up to help Jewish people that have been captured by the Germans and were considered to be part of the partisans. I have read many different stories about the partisans in effort to better understand the concept and reasoning behind them. The stories and articles I’ve read about you and your brothers’ partisan group called the Bieleski otraid have been very interesting and I would love to better understand with your help. Thank you for taking time out of your day to read an answer the questions I have about your story. I hope we are able to educated people about your attempt at heroism during the time of the war. My name is Connor Dolan. I am the curator at the Virginia Holocaust Museum, located in Richmond, Virginia. Our museum has been privileged enough to receive a rare collection of photographs dated back to the holocaust. After examining the photographs and researching the history around the holocaust, I have some interesting discoveries. I read about your survivor story online and your story relates highly to the picture we have here. I want to get as much information from this picture as possible and I was hoping you could help me. You talked about the type of things that went on in the Hadamar Institute, but you never described what the living style was like there. The picture that I have does not show the inside of the institute nor the people in it. The picture that I was given show the over view of the institute and its size. Do you think you could describe to me what it was like living inside that institute and what the inside of the building looks like? I did some research on the institute and it said that they sent people who had disabilities there for execution. What kind of disabilities did you see inside that institution and how were they treated by the people there? Would it be ok with you if the holocaust museum used your story for our museum? If so can you answer a few of my questions and tell me what it was like to be in that institute? How did the people there treat the prisoners with disabilities and why did they treat them this way? Can you best explain to me what that institute was used for? What did you and some of the other survivors do to keep yourselves going and to not give up? I would like to thank you in advance for reading my letter and for sharing your personal story with me to give me a better understanding of what happened during the holocaust. Hello my name is Jacob Cardounel, I am a curator for the Virginia Holocaust Museum, located in Richmond, Virginia. I was going through a bunch of pictures in our basement and I came across a picture of Auschwitz. I have done some research and I came across your name in the survivors list. We are starting a new exhibit on Auschwitz and we want to take our exhibit farther than just facts. I was hoping that you would be able to give me some personal insight on life in Auschwitz. Of course, with your permission, your story will be seen by anyone who visits the museum so I would need and written letter saying that you give me permission to use your story. I have a couple questions that I would like you to answer if possible. What type of food was served in to you all when you were allowed to eat? On average how many people slept in one barrack? Did you make any relationships with people that were in the same barrack with you? My final question might bring back some bad memories, but it will really help show the severity of the torture. What was the worst thing that you ever saw happen in Auschwitz? I also ask that if you write me back with your story that you be as detailed as possible. I don’t want anything to be unclear. In your story it says that you were thrown into a train car with many other Jews. If you could estimate, how many people were in the train with you? Also, you state that your id number was 139829, was there any certain relevance to your number? During your time there you noted that you were a slave. When you were working it says that you hurt your finger really badly. What type of work were you doing when you hurt your finger? The reason that I am asking all of these questions is because of the picture below. 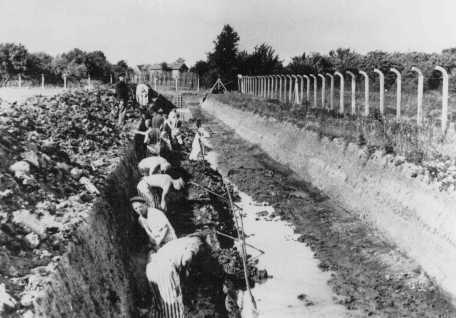 As you can see, the slaves are working away at making some sort of ditch or trench. I was wondering what other jobs were done. Did you ever have to help dig a trench or ditch? Your story really relates to this picture because you were a slave and you know first-hand how this all works. I hope that I hear from you soon. I am very excited to hear all of your story’s and for you to share your experiences with me. Who knows maybe one day you could come out and visit our museum! How are you? I am doing fine, I work at the Virginia Holocaust Museum in Richmond, Virginia as a curator. We have some photographs from the WWII era and I have been put in charge of researching some. I read your story (at http://www.holocaustsurvivors.org/) and I see that you went through some very hard times. We would like for you to answer some questions so we can provide some information of the photos. In the picture it shows women doing something in a line with many shoes and other objects. Was there anything like that at the camp you were at? 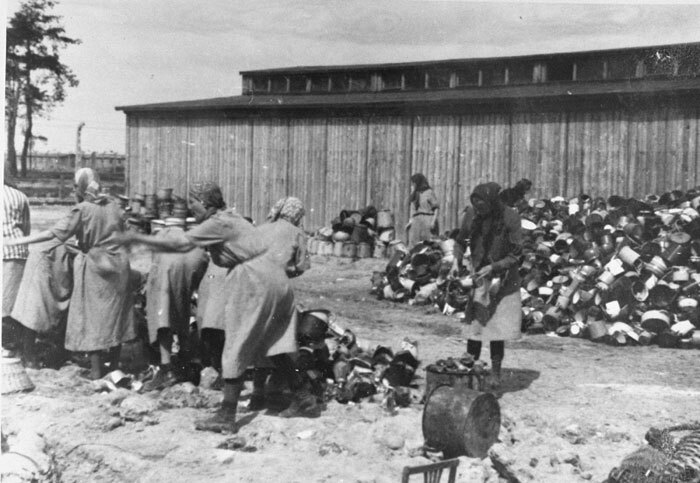 The women look like they are organizing many shoes, it must have been hard to deal with objects when you know the owners of the shoes were just brutally killed. We at the Museum would like to use your story in order to teach many people about history. I would like to ask you a few questions now. In your story you say that in order to use the bathroom you had to do it in a pit, and that the guards would shoot at you. How scared were you in getting hit from a bullet? Did you ever hope that you might get hit so that the suffering would end? How did you and the others in the camp maintain hope? Did you ever doubt that God exists and that someone would save you? Thank you for answering any questions and for allowing us to use your story. My name is Parker Ring. I am a curator at the Virginia Holocaust Museum. Recently we have been sent a series of photos of the Holocaust. I have found an interesting discovery concerning your story and the story of someone in one of the picture. I am writing to you because I saw a picture of Maximilian Kolbe, a priest killed in Auschwitz during the Holocaust. I have read about your remarkable story and have seen the similarities between your story and the story of Maximilian. I have read that you escaped a concentration camp with two other people. You stole a car and drove right out of the front entrance to escape with two other people. One of the people you escaped with was also a priest. Maximilian Kolbe, the man in the picture, volunteered to take the place of someone to go to Auschwitz. Also, I have read that you were there when Maximilian Kolbe volunteered to take the place of a man to go to Auschwitz. Despite your escape both of your stories were very similar. You were both kept at Auschwitz and you had both seen each other. Maximilian Kolbe was a priest and you escaped with a priest. Would you mind if we used your story here at the Virginia Holocaust Museum in our exhibit? It would help explain this terrible time in history to other and ensure that history doesn’t repeat itself. If you would let us use your story can you answer a few questions? When you were at the camp what was the punishment for trying to escape and what gave you the courage to attempt it? Did you know the people you escaped with well or were they just there when you escaped? How were priests treated in concentration camps? A lot of people gave up hope when at the camp. Why didn’t you? Thank you for everything. If you allow us to use your story it will help educate people unfamiliar with this tragedy and prevent it from happening again. My name is Mikayla Bucker and I am a curator at the Virginia Holocaust Museum in Richmond, Virginia. Not too long ago, we received a collection of pictures from the holocaust and a few of them caught my interest, including a picture of a Nazi death train. The picture intrigued me and I tried to find as much information as I could to go along with the exhibit. I found only a few names mentioned along with any death train, and yours was among them. After researching more on your background and your story of survival, I decided that I would try to get in touch with you and was hoping that you would be able to share more information on your journey of survival. The museum, and myself, could certainly use your help in this endeavor. You talk about people trying to get away from, or jump off of the train that you were on and into the snow. You said that many were shot down by the Schutzstaffel, Protection Squad on top of the train. The picture that was found of the death train conveys a rather similar, yet gruesome scene. In this picture, there are multiple bodies spread around the train. It seems that those who were killed were obviously trying to get away and were shot down in the process. Men are walking around collecting the bodies, I assume, or trying to keep the living people still on the train. Is this scene in any way similar to your experience? Would the Virginia Holocaust Museum be able to use your story in the holocaust exhibit? If you are able to go in to more depth, I have a few questions I’d like to ask you. In your story, you talk about the way that other people interacted with the Jews even before the Nazis started interfering. Does this mean that you were older, say, in your teenage years, when the German soldiers started harassing or taking Jews to concentration camps? How did you keep the will to live and stay somewhat positive throughout the entire ordeal? You also talk about finding shelter from different people. When you think of those memories or families, do you associate them with a feeling of thankfulness or with a feeling of fear? My final question may have multiple answers and there may have been multiple incidents. Throughout your years of being on the run and staying out of sight, did you have any extremely close encounters with the Nazis or any other enemy of the Jews? Thank you very much for your consideration of this matter. I hope you are able to help us with this exhibit.